Built in the traditional New York style of loft residences, the 2200 Arch condominiums feature industrial chic living spaces with over height ceilings. Located in the former Belber Trunk and Bag Co. factory, the building units feature expansive glass windows providing spectacular views, partially exposed mechanicals, wood beams, and hardwood floors. The building is pet-friendly and features a twenty-four-hour doorman, providing residents with a great urban fine living space in a convenient location. 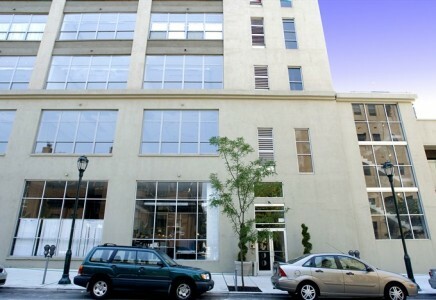 Tiled bathrooms and washer and dryer hookups are other features at the Philadelphia real estate 2200 Arch loft condos as well as on-site deeded parking. Centrally located, the 2200 Arch lofts are within walking distance to the city center, Art Museum District, 30th Street Station, and Fairmount Park. The 2200 Arch lofts provide residents with sophisticated urban living in a stylish and historic space.